Works immediately – out of the box and in your mouth! The Snore Defense anti-snoring device has FDA clearance to treat snoring; the Snore Defense anti-snoring has been also certified by the GMP for a high quality manufactured product. In order to obtain both, FDA clearance as well as GMP certificate, Snore Defense had to prove not only that the material which it is made of is safe, that the product perfectly achieves its purpose, but also that the device is a high quality long lasting product. The main purpose of Snore Defense is immediate relief of the snoring problem; it gives as an addition an excellent anti-bruxism solution. 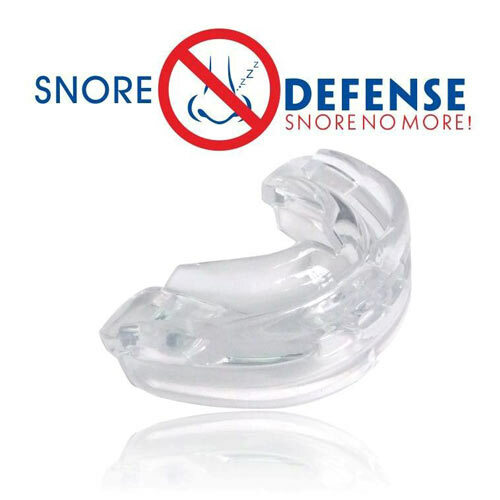 Wearing Snore Defense, will prevent the damage to your teeth which is caused by the grinding while you are sleeping. Snore Defense is a 2-in-1 revolutionary innovation that make your life easier! "Snore Defense was designed and created in conjunction with Ear, Nose and Throat specialists". "I have a deep sleep through the whole night and wake up rested. It definitely worked for me." "I'm very satisfied to finally find a product that keeps on his promises. I have not snored since I began using Snore Defense." "My mate was amazed that I slept so soundly and quietly. Thank you so much Snore Defense!"